atmosfair tenders for projects by means of established contacts and international networks. After an initial examination, atmosfair contacts the developers to inspect the quality and chances for successful implementation. In general, several dozen projects are proposed, of which the best projects are shortlisted. 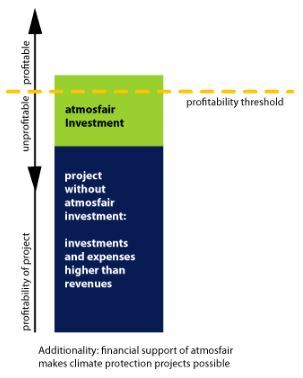 In the end, only a small number of projects remain that meet atmosfair’s rigorous requirements. Missing evidence of the project’s additionality is the most common cause for non-admittance (see figure regarding the criteria of additionality). In other cases, the calculated reduction potential or the project schedule is deemed too optimistic. atmosfair’s Advisory Board for Environmental Standards approves new projects. When signing contracts, atmosfair follows a well-established principle in order to reduce the risk of making bad investments; the contract is signed before the project begins, but payment is due only after the actual reduction of greenhouse gases has been acknowledged by an independent controller. The contract allows the operators of a project to find investors and receive loans. Meanwhile, atmosfair avoids losing donations to failed projects. Exceptions to this rule are possible since some projects cannot begin at all without financial support. In this case, atmosfair conducts a preliminary risk assessment beforehand. Companies like TÜV examine potential projects according to the Gold Standard criteria in the proposed locations and consults with the local population. Additionally, the project design documents are published on the webpage of the UN climate secretary (UNFCCC) to make a worldwide hearing possible. At this stage, some projects already fail due to the resistance of stakeholders. However, neither local populations nor environmental NGOs have ever objected to atmosfair projects. The project design document records the questions and answers from the hearings. The additionality of the project as well as the amount of emissions to be reduced are crucial parts of the assessment. Sometimes the amount of emissions to be reduced must be adjusted. This is not unusual since external audits show that many projects achieve one third less emission reductions than originally planned by overly optimistic investors and operators of projects. For this reason, an independent audit is of great importance in order to guarantee that donations are actually being used to reduce greenhouse gas emissions. Controllers also play a crucial role when it comes to measuring the real emission reduction achieved by projects. This is usually based on the data recorded. atmosfair receives these reports in the form of certificates and stores them in its account at the German official registry, which was established in 2005.